Does your child have ADHD? If so, you probably know you’re not alone. One in ten kids, aged 4 to 17, is diagnosed with Attention Deficit Hyperactivity Disorder. Stick to the same routine every day – including getting up at a consistent time, setting times for homework and playtime, and eating dinner at the same time each night. Write down your family schedule and post it prominently in your home. When you have to make a change, let your child know as far in advance as possible.Your son or daughter may not remember that you said you were leaving for church at 10:30 because something sparkly might have caught their eye instead. Posting a schedule will reinforce the timelines that you have in your head. Encourage your child to use a calendar or daily planner to keep track of homework, assignments, and materials to bring to/from school. Create a designated area for your child’s shoes, coat and backpack.Some children may have the ability to remember where both of their shoes are and what pages in a textbook they need to read. But, your ADHD child probably cannot. Setting up a system of checks and balances will be a great tool for overcoming the forgetfulness. Put consistent rules in place, especially for scheduling and systems, and when your child follows them, offer praise and occasionally, a small reward. Your child with ADHD might function differently than you do, but giving him or her the tools to cope with their symptoms will be the best gift you can give. Truthfully, at age 35, I still leave my coat in restaurants, I cannot ever find my keys, and I will not remember an appointment unless I write it down. ADHD symptoms do not go away with age. We simply must learn ways to overcome our idiosyncrasies. Helping your child now will not only bring more peace to your family, but will also give your child a brighter future. 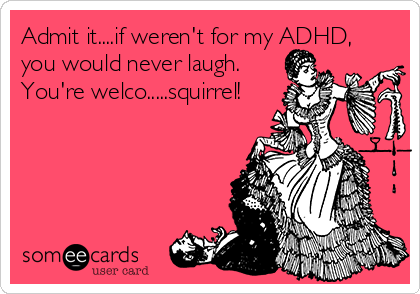 Also, many communities have ADHD resource centers with counselors who can help children establish routines and systems. I would absolutely find one, if I were you.